this. These ads were triggered by a search query along the lines of “plumber serving Philadelphia” or “electrician in San Francisco.” And they encroached on a market previously supported by the likes of Angie’s List, HomeAdvisor and TalkLocal. Since then, the scheme has been in the trial stage in a couple of markets, and it’s now likely it will be rolled out across the US, albeit more slowly than previous Google roll-outs. 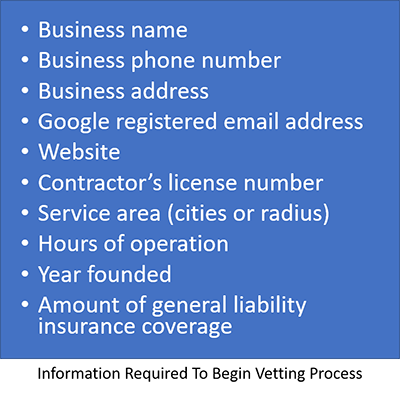 Google users will find it convenient to call the local contractors who appear in their search results, However, will they trust these contractors to do a good job? 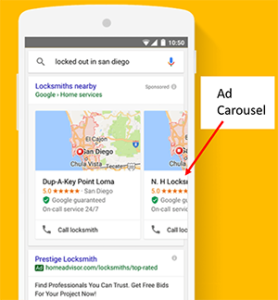 After all, doesn’t Google just accept advertising dollars to promote a particular company? The answer explains the unusually long roll-out period for this initiative: Google has stated that every prospective Home Services advertiser will agree to criminal background checks and provide confirmation of current trade licenses and insurance coverage. Examples of such licenses are given here. Google also claims it will “do research on the online reputations of each Home Service pro” and will respond to negative customer reviews by lowering ad rankings or by excluding the ads of poorly reviewed service providers. However, consumers have been aware that ads appearing at the top of the search results have typically been paid for by the highest bidder, not necessarily the better service provider. So, up until now at least, consumers have often relied on review based websites such as Angie’s List to find good contractors. Now with Google Home Services, Google hopes to win this market by not only displaying ads at the top of page one, but also offering an online review system and a service guarantee that may win over previously reluctant home owners. Thus, home service providers need to watch for when Google Home Services launches in their own localities so as to get on the bandwagon from the get-go. Experience has shown that when Google launches a successful new service, it is very disruptive to the status quo. Most consumers are very time-sensitive and if Google Search shows up a selection of highly rated, reviewed professionals, few people will go beyond that list to look for Angie’s List, Home Advisor or YP (Yellow Pages) listings. To learn more about the roll-out of Google Home Services, give the experts at PPC Rainmakers a call. Call (972) 867-3100 or fill out the form below for more information. © ALL RIGHTS RESERVED | A FUNNEL SCIENCE COMPANY PPCRainMakers.com is not owned by or affiliated with Google.